Andover&apos;s Sara Carleo (6) looks to block Methuen&apos;s Carolyn Curley (right) in the third period at Metheun High. Lydia Pendleton refused to let history repeat itself. The Tewksbury junior scored twice and added an assist as the No. 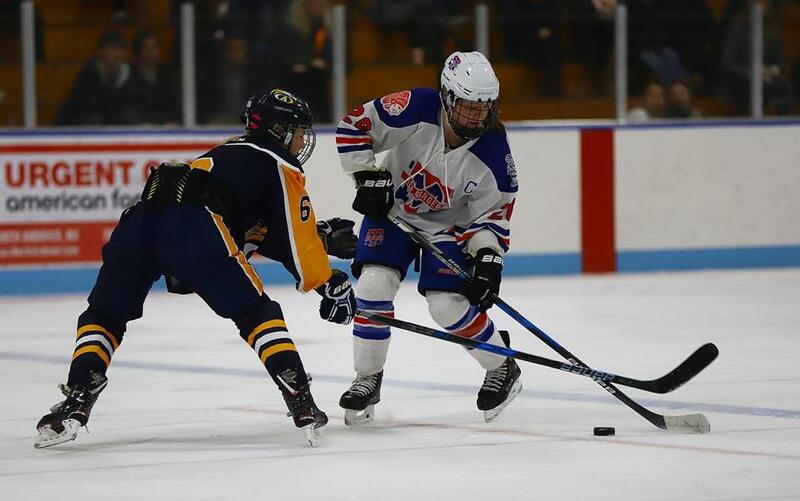 2 Red Rangers (12-1-1) knocked off third-ranked Andover , 5-1, Wednesday night in Methuen to earn their first win over their Merrimack Valley/Dual County opponent since January 2016. With the win, Methuen/Tewksbury improved to 5-1 in MVC/DCL Large play, still second to the Golden Warriors (12-1-1, 5-1-1 MVC/DCL). The Red Rangers scored twice in the opening six minutes to take a 2-0 lead they would carry until the third period. Senior Cassidy Gruning opened the scoring from her position at the left post, completing a feed from Pendleton at 2:22. Four minutes later, Pendleton, in front of Andover’s senior goalkeeper Sean D’Urso, fired home a feed from senior Julia Masotta to double the advantage on the power play. D’Urso refused to let up in the middle period, stopping 17 shots and surviving a penalty-ridden period. She closed the night with 24 saves. In the second period, starting defender Katie Adams was in the box for roughing at 5:36 and again at 11:03, one of four skaters to be whistled in the frame. For M/T, freshman Jessica Driscoll was called for tripping one minute in before the Golden Warriors gained a five-on-three advantage, with Brenna Greene and Julia Masotta also off the ice. The Red Rangers were whistled three more times in the final period, but their penalty kill staved off any Golden Warriors attempts. 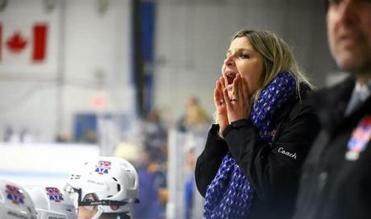 Methuen/Tewksbury girls’ hockey coach Sarah Oteri shouted encouragement to her overworked penalty killers. Andover’s Emma Gilmartin tallied with 1:13 gone in the final period to make it 2-1 and creep in on the Red Rangers, who responded with three goals in the final five minutes to seal the victory. Pendleton scored her second of the night on an assist from Masotta, who finished a pass from senior defender Megan Forbes to make it 4-1. After Andover pulled D’Urso, Masotta picked up the empty-netter. Duxbury 4, Braintree 3 — Senior Emily Ballerene tipped home a loose puck with 39 seconds left to give the No. 5 Dragons (13-0-1) the dramatic win at Zapustas Arena in Randolph. The Dragons got off to strong start scoring three goals in the first period, including two by junior Molly Duvall. In the second period, Braintree rallied to tie the game on goals by Abbey Holland and Delia Lee. Brooks 4, Thayer 2 — Caroline O'Keefe netted a hat trick and Mia Laplante scored another for the Bishops (13-1-2). Goalie Caroline Kukas had 20 saves for Brooks. Mansfield 4, Franklin 1 — Senior Cassi Ronan netted a pair of goals and classmate Regan Paterson recorded her 100th career point for the No. 6 Panthers (12-1-1) in the Hockomock win. Nobles 5, St. George’s 0 — Sohpomore forward Katie Pyne and freshman forward Emma O'Leary scored each scored to power the Bulldogs (15-0-5). Westwood 4, Medfield/Norton 1 — Kat Keith scored three times, Emma Conway added another, and Hannah Blomquist assisted on two goals for the No. 7 Wolverines (10-1-3). Burlington 6, Arlington 3 — Joe Barbieri and Sean Savage each scored twice, including a full-ice empty-net tally for Savage’s second, as the Red Devils (7-4-2) knocked off the No. 5 Spy Ponders (9-2-2). Connor Quinlan and Mitchel Maida also found the back of the net in a four-goal third period for Burlington that included two empty-net goals. Bishop Feehan 4, Bishop Stang 2 — Junior Jason Sullivan netted a pair for the Shamrocks (6-5-3) at the New England Sports Village. Attleboro 9, Stoughton 2 — Sam Larkin netted a hat trick for the Bombardiers and Cam Littig added two goals of his own in the win. Milton Academy 71, Brimmer & May 65 — The Mustangs (12-3) got contributions up and down the lineup Wednesday night at Brimmer and May, hanging on for a nonleague victory despite several late pushes by the home Gators. “We’re so deep and we have nine guys who can play and that makes a huge difference for us,” said Milton Academy coach Lamar Reddicks. 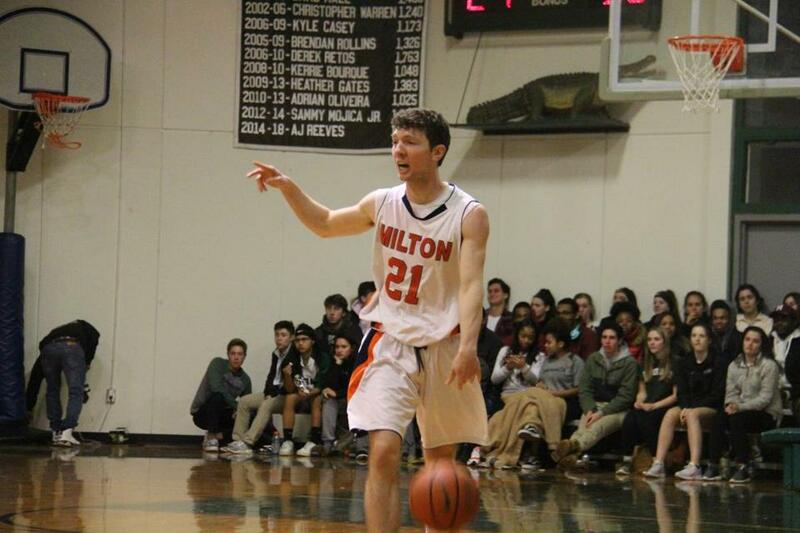 Milton Academy senior point guard Jake Seeherman runs the Mustangs’ offense at Brimmer & May. Sophomore guard Casey Simmons had 16 points – including two huge second half dunks – and senior forward Daniel Schlakman added 15 points. Senior guard Drew Thibeault (10 points) hit a 3-point dagger from the left wing that made it 67-60 with 1:30 to go. “We have someone that’s ready to make a big shot for us every game,” Reddicks said. Sophomore guard Kyrell Luc led all scorers with 17 points for Brimmer and May (8-6). The Gators missed 17 free throws. Belmont Hill 52, St. Mark’s 49 — Kevin O’Boy led Belmont Hill (5-10) with 25 points. Cohasset 71, Atlantis Charter 68 — Senior co-captains Brad Albanese and Mark Mahoney scored 21 points and 14 points, respectively, while sophomore Jimmy Grech added 12 points for the Skippers (9-4). Roxbury Latin 69, Tabor 59 — Senior Miles Davis and junior Charlie Weitzel scored 18 points apiece for the Foxes (11-4). St. Sebastian’s 60, BB&N 48 — Sophomore Lyndel Erold led the Arrow with 25 points. Worcester Academy 80, Master’s Academy 70 — Trailing by 24 points at halftime, the Rams (14-4) rallied back for a double-digit victory. Senior Jordan McAllister and junior Josh Ogundele combined for 34 points in the second-half recovery. Cardinal Spellman 75, Pope John 63 — Junior forward Craig Faria scored 32 points to carry the host Cardinals (6-10). Arlington Catholic 55, Matignon 40 — Junior center Cam Garber recorded 15 points and 10 rebounds to lead the Cougars (7-7). South Shore Voc-Tech 68, Upper Cape 46 — Junior guard Kyle Schlieff recorded a career-high 27 points to go along with his 11 rebounds for the Vikings (8-7). Latin Academy 77, East Boston 26 — Junior Fiona Mannion, Sophomore Jordan Billot and freshman Ruth Norton combined for 53 points as the Dragons (11-1) rolled. Burke 39, South Boston 30 — Senior Shantell Johnson notched 26 points and 13 boards to carry the Bulldogs (3-9). Lincoln-Sudbury 44, Weston 43 — The Warriors (5-8) took the lead for the first time on the game’s final basket, a winning 3 from senior Karly Van Leer with 8 seconds left in the Dual County League matchup. Senior Paige Maxwell led L-S with 16 points and 14 rebounds. Peabody 57, Saugus 51 — Senior Catherine Manning tallied 19 points and 11 rebounds and classmate Liz Zaiter added 17 points and 14 rebounds for the Tanners (12-1). Mount Alverina 27, Chelsea 25 — Junior Grace Isberg scored her lone basket of the game with seven seconds left as the Mustangs (5-10) survived a 2-point fourth quarter. Bay State Conference championship — Natick (334 points) did not have an individual first-place finisher, but the unbeaten Redhawks swept the 200- and 400-yard freestyle relays to repeat as conference champions at the Evelyn Kirrane Aquatic Center in Brookline. Needham (288) was second and Framingham (283) third. Allen Cheung, Matthew Kwan, Brian Cheung, and Ben Schmelmer won the 200 free and the two Cheungs, Ben Schmelmer, and Antonio Arena captured the 400 free. “Just a phenomenal performance from our kids, depth was the difference,” said Natick coach Caitlyn Shaddock. Dan McLoone reported from Burlington, Matt MacCormack from Chestnut Hill, and Dan Shulman from Randolph. To report scores, call 617-929-2860/3235 or email hssports@globe.com.